I'm not the parent of a young teen, but I will be in about a decade. And when that day arrives, I'll be sure to check back on the wisdom shared in Marko's fantastic resource, Understanding Your Young Teen. It's essentially the parenting version of Marko's section in the youth ministry tome, Middle School Ministry, offering insight into the ever-changing world of 11-14 year olds. Change. That's the word Marko uses to describe this season of life. This change is holistic, from physical to cognitive to emotional to social to spiritual. Marko encourages parents to relationally engage with their young teen on all these levels, taking a posture of humble understanding and guidance. He proposes some new metaphors beyond the disciplinarian or the disconnected parent: cultural anthropologists and adventure guides. Marko's metaphors remind me of Richard Dunn's discipleship phrase pacing-then-leading, found in his book Shaping the Spiritual Life of Students (the best book on teen discipleship I've ever read, btw). We enter into a teen's life, pacing alongside them at their pace, which requires a posture of listening. As we pace, we also point out potential pitfalls and open their eyes to new visions and vistas they might have otherwise missed, leading them into maturity. The tone of the book is practical and friendly while also clearly deeply informed. Marko has 30+ years of experience with ministry to young teens, as well as parenting two teens of his own. Yet he never comes off as overly didactic or formulaic; he practices what he preaches, offering insights as a fellow parent and guide with a tone of humble confidence. I also loved the other voices he invites into the conversation--at the end of each chapter, there is a section contributed from a fellow middle school expert, as well as a bonus chapter from Kara Powell and Brad Griffin from the Fuller Youth Institute. One of the themes that emerges is normalization. With so many changes, parents can continually remind their young teen that they are, in fact, okay. "We must always be ready to slip 'It's okay,' 'It's normal' and 'It's good' into our conversations with our young teens. These statements constantly remind them that their changes are normal and good and that they'll turn out great." (pg. 38) No one wants to be viewed as abnormal or bizarre; to offer genuine words of security and comfort can be a sacred act of love in a young teen's life. My favorite chapter is the one on young teen culture, entitled "White-Hot Temporary." The insights in this chapter alone are worth the price of the book as Marko exegetes the current cultural trends of early adolescence. With sub-sections on "an intense but temporary culture" and "a driven yet sedentary culture," there were so many descriptions that accurately describe the young teen cultural zeitgeist. To understand the culture requires patience and grace, but that's exactly what Marko is encouraging: understanding. 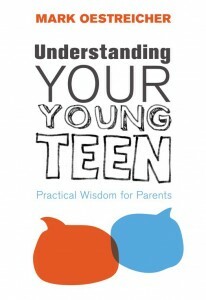 "If you understand why your young teen thinks, acts, and feels the way he or she does, you'll be in a significantly better place from which to engage with your child." Understanding and engagement--two critical values to godly parenting, and values that permeate Understanding Your Young Teen. finished reading the book and it is a great read. I appreciate the way you illustrated the book with all the examples. It really helped making concepts easy to grasp. My favorite chapter was on physical and sexual development. As a youth pastor this is the chapter I want to send to all my parents. Great book as usual.